England can only strive to somehow revisit perfection after setting the bar for their new era impossibly high in the record victory over New Zealand. As the series moves on to The Oval, Sheffield’s Joe Root is not about to rule out another performance of the same magnitude achieved at Edgbaston on Tuesday - when England piled up more than 400 for the first time in history en route to a 210-run win. Root, one of the Birmingham centurions alongside Jos Buttler, knows the remainder of the five-match series presents a significant test of the hosts’ new adventurous methods. “The way we played was pretty much the perfect performance” said Root. He has reason to believe nonetheless that he is part of a team who can match them these days. “I feel in great, great touch at the minute,” said the South Yorkshireman. “We committed to being very aggressive and we also knew how talented our batting order was, having Liam Plunkett coming in at 10 and Finny (Steven Finn) at 11 - who’ve proven over the years they can clear the ropes. It was from the stands, and on television, too - an important point not lost on Root, as England seek to re-engage supporters disappointed by their World Cup flop. “It was great fun,” he said. “I’m sure all the crowd were just as excited as we were really. 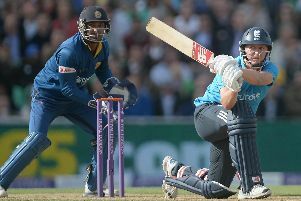 Root and Buttler’s batting was breathtaking and memorable - and Rashid produced a career-best in both disciplines. The key, though, is that England’s new era does not prove a one-hit wonder. Only last year, Borgeous - aka American DJ John Borger - provided the latest in a long list of cautionary tales on that score from the world of music when his Tsunami (Jump) went to number one in the UK and then his follow-up single did not even reach the charts. For good measure, it was inappropriately titled ‘Invincible’. Root needed no reminder of any of that to know the onus is on England to prove they have substance to go with a big-hitting style to which they will remain committed come what may. “It is only one performance ... but it is very exciting going into the rest of this series,” he said. “Obviously it is not going to happen every week, but it is something we definitely want to try and do.